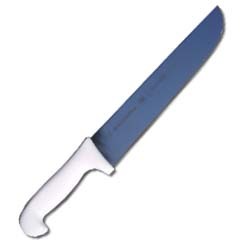 The 10 inch ice-hardened stainless steel blade, sharpens easily and holds an edge well. A polypropylene handle provides comfort and safety. For use with all cuts of meat. Wildwoods authentic Brazilian carving knife is prefered by 90% of all brazilian steak houses. Sharpens to a razor sharp edge with minimal effort. Takes an edge well and holds up in the demanding environment of commercial use. NSF certified.